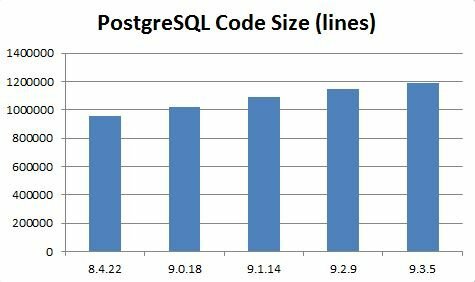 With PostgreSQL 9.4 just around the corner and 8.4 just retired I thought it is time to review those years of development to see how the size of the PostgreSQL code base has evolved over time. In the past couple of years (I even already got to say “decades”) a lot of development has happened and all those changes had a significant impact on the sheer volume of the code. 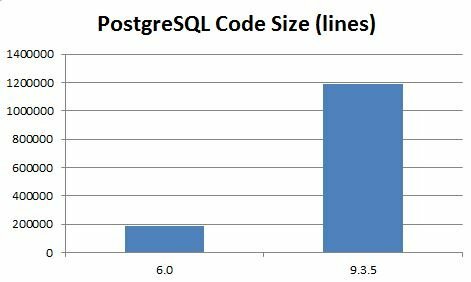 Out of plain curiosity I decided to start a little analysis regarding the code size of the PostgreSQL project over time. The interesting thing here to see is that the size of the code has grown fairly consistently over time. From one major release to the next we see a constant increase in code source, which is more or less stable over the years. Just out of curiosity: On 29th of January 1997 PostgreSQL 6.0 was released. A long long time ago. Guess what the size of the code was back then. PostgreSQL has come a long way since then.